Is Isle Royale A Case For Ecological Intervention ? You would be totally forgiven if you had never heard of Isle Royale National Park. It is an island that is located in Lake Superior in the USA. The park is a designated wilderness site. No vehicles are allowed and only primitive camping is permitted. There is no land bridge but there was an ice bridge in the late 1940s. Wolves ( and presumably moose ) migrated to the island using this ice bridge. In the 1960s, ice bridges only formed every two out of three winters. However, with global warming, the ice bridges now form about once every 10 years. The last know wolf crossing was in 1997. The wolf population on the island has declined from 24 in 2009 to 8 in 2013. There has been quite a bit of activity on the Internet regarding Isle Royale’s wolf population. Some of these offerings are listed later in this post. The question that keeps coming up is, should the US Park Service (USPS) let that wolf population decline and possibly die off or should the USPS employ active restoration by adding new wolves to the gene pool at Isle Royal ? The USPS calls it a “genetic rescue” because of the heavy inbreeding of the remaining wolves. Arguments for the restoration by scientists center around the desire for a continuing study of wolf/moose interrelationships and the decline in flora on the island through accelerated foraging by an expanded prey (the moose) resulting from little or no predation by wolves. It is the argument of passive restoration versus active restoration. Passive restoration could mean no restoration at all unless an ice bridge forms and wolves were to find the ice bridge. Ecological restoration can be defined as “the process of assisting the recovery and management of ecological integrity,” including a “critical range of variability in biodiversity, ecological processes and structures, regional and historical context, and sustainable cultural practices” (Society of Ecological Restoration, http://www.ser.org/definitions.html). Restoration can be “passive”, in which the degrading agent(s) is identified and removed without any further action by man. Active restoration is where management techniques are employed (such as reintroduction) with a particular goal in mind. The need for any kind of restoration assumes some level of impairment in an ecosystem. But these definitions are typically applied to ecosystems where mankind has created some sort of ecological damage. This is not the case at Isle Royale because it has been capably kept in a pristine state by the USPS. Wolves and moose came to the island by way of a natural ice bridge which is now only seasonally available. The negative hand of mankind could only be attributed to the yet-to-be proven effects of global warming causing the ice bridge to form less frequently. For me, I vote for passive ecology with the USPS not intervening and letting Nature take her course as has been the case at Isle Royale for a long time. Mankind would simply be meddling with Nature. The wolf and the elk appeared through acts of Nature, mankind’s hand played little or no part in these creature’s lives on the island, and future acts of Nature should determine the ecological fate of the island. Man’s desires and intentions, such as the desire for further research, should not be an influencing factor in the decision by the USPS no matter how noble and sincere the intentions of the researchers. Thanks for reading this blog post. Here are some useful references about Isle Royale. Silence of the wolves: Should we save the 8 on Isle Royal? Should the declining inbred wolves of Isle Royale N.P. be augmented? 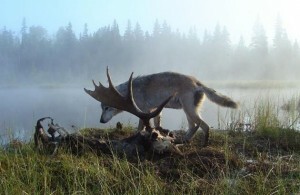 Climate Change Is Killing The Wolves Of Isle Royale. Should The Government Save Them? Thanks Bill. I agree with you about future action here. Wolf assistance seems more justifiable in places with room to grow (and cattle to eat). They should bring in more wolves. Nature didn’t “cause” global warming – we did. And it’s getting worse every year. The likelihood the wolf population on Isle Royale will survive another decade is extremely low, and the research value alone justifies our “meddling”. Furthermore, we are ALREADY meddling . . . by camping there, observing the ecosystem, and by inhabiting the rest of the known world. Passive meddling or otherwise, it’s irrelevant. If it wasn’t for our destruction of the Chapman cycle the ice bridge would be available for use each winter by wolves and moose. Hi Matt: Thanks for responding. I completely agree with everything that you’ve said. I like your word “meddling”. Meddling goes far beyond just Isle Royale. Our government organizations meddle by trying to calculate how many creatures we should kill each year — all in the name of conservation. The myth is tragic because modern science has shown that man cannot control Nature because man cannot predict the results of any action within a complex system. Ecosystems are complex systems. The meddling needs to stop and these people need to take some courses in systems science. But, then, how do we control the political will of hunters and the agriculture industry??? Isle Royale’s ecology has been significantly modified by human activity for decades. In the specific case of the wolf population, it was severely affected by canine parvovirus–introduced by dogs brought to the island by humans. This is the most important predator-prey population study ever carried out, and for it to be ended in the name of some mythical abstraction of “naturalness” would be an idiotic tragedy. Thank you so much for your comment. You’ve certainly helped us to see another perspective on this issue. I am particularly interested in hearing more about the human introduction of dogs. We’ve got dog issues in a bird sanctuary where I do some conservation work and I can’t seem to move anyone. Any more info or sources you could provide would be greatly appreciated. Don’t misunderstand – it’s not as though we’ve learned nothing. Much insight has been gained, for example, about wolves’ tendency to kill moose that are likely to die from other causes, the effect of climate and forest processes on animal populations, and even the role of ravens in shaping the distinctive social nature of wolves. The lessons we learn seem to come more from explaining the past rather than predicting the future. For example, we didn’t predict the great population crash of wolves in the early 1980s or the moose crash in the mid 1990s. But afterward we were able to recognize circumstances that had lead to those and other events. Natural history might be much like human history – explainable, but not predictable. Isle Royale illuminates one of the oldest questions in all ecology, “Is Nature best understood as the result of predictable law-like patterns that ecologists take as their task to discover?” Or, is Nature better understood as the result of innumerable contingencies, essentially a historical process that can be explained and understood but not very well predicted. Is Nature deterministic or contingent? Is ecological science like the study of physics or more like the study of human history? Does ecological knowledge basically boil down to natural history with lots of numbers and statistics? If we see Nature as a system whose future we can predict, then we will be confident in our efforts to control and manage Nature. If, in Nature, we are more impressed by its essentially contingent, and hence unpredictable character, then our relationship will be more strongly rooted in striving to live within the boundaries of Nature’s beautifully dynamic variation. Western science has come to understand a great deal about Nature. But pride for our knowledge of Nature, need not become hubris to fuel an obsession with controlling Nature. The wolves and moose of Isle Royale show how it is not so difficult to be proud for all that we’ve learned about Nature, yet humble for knowing how limited our understanding of really is. This is the humility from which a rich relationship with Nature may be rooted.